In a flurry of activity in these past 10 months, directed-energy-based surveillance and anti-personnel systems have suddenly leaped off of physicists' drawing boards into the world of reality, thus obviating the criticism, it would appear, that the attached publication concerns nonexistent technologies. Indeed, directed-energy technologies appear to have evolved at such a rapid rate that they are now being promoted as the "Final Solution" to crime -- preliminarily, at a classified conference sponsored by the Los Alamos National Laboratory, hosted by the John Hopkins Applied Physics, and supported by the American Defense Preparedness Association. Clearly, given this conference, data concerning the efficacy of acoustical, how-power microwave, laser, ELF/RF weapons and "psychotronic" systems is sufficient to allow for their now being promoted as tools for law enforcement. What is note worthy in this sudden flurry of activity is that no one has bothered to ask the following very basic questions: (1) Where is the test data being obtained? (2) What, so far, has prevented this government and its contractors from testing these technologies on U.S. citizens under involuntary circumstances? Absent answers to -- or government interest -- these questions; and because the symptoms experienced by those now in touch with this Project parallel those reported in the media as being the effects of directed-energy targeting, we conclude that no restraints have been placed on those charged with the development and testing of directed-energy systems; and the U.S. citizens are indeed being experimented upon under involuntary circumstances. It is in this context that we note that Los Alamos strongly urges, in their brochure, that "industry" attend the aforementioned classified conference, since "(i)ndustry, particularly, will benefit from a more precise nderstanding of...operational constraints regarding [these] technologies." Perhaps "industry," as a minimum, will also be made to understand that a failure to comprehend that said constraints will ultimately lead to vigorous, civil rights-based prosecutions. As to the alleged mental illness of the persons in touch with this Project, it should be noted that government-sponsored stalking and harassment, mind control experimentation and simple torture can indeed produce symptoms which might be regarded as a form of mental illness. Deliberate terrorization can take a toll. Mental illness caused by government-sponsored terrorization, however, does not invalidate that terrorization. It should be noted that The American Psychiatric Association -- in its various revisions of the Diagnostic and Statistical of Mental Illness – seems to have conveniently omitted all reference to harassment, stalking, mind-control experimentation and torture as a case for mental illness. (The DSM is a psychiatric profession's diagnostic "bible.") The APA's refusal to acknowledge the impact of terrorization upon the human psyche, even given the publicity stemming from the Church Committee's findings in 1975, raises serious questions about the validity of psychiatry as a profession in this country, not to mention, the APA's ethical intent, in the long term. All categories of types of complaints being received by this Project have also changed since publication of this report. Survivors of certain satanic cults (alleged to protect the interest of government and military "political satanists" in this country; former Vietnam-era "programmed assassins," prison inmates, and so-called "UFO abductees" are now reporting an array of experiences (and symptoms) which are remarkable similar to those addressed in this report. Experimental drugs, induce auditory input, vicious overt harassment, attempted psychiatric discrediting (unless the experimentee dutifully claims to be a UFO abductee), and an extremely painful array of externally-induced symptoms are included in this shared panoply of experiences. The impression created by these burgeoning complaints is that mind-control experimentation in this country is being pursued in at least five specific areas. Evidence is more recently surfacing that unwitting government employees may qualify as yet another category of experimentee -- those employees, in particular, who are experiencing the effects of so-called "sick buildings." It has been suggested that the long-term objective of all this experimentation is to develop a system by which all (surviving) citizens of this country can be monitored and tracked by a sophisticated, perhaps satellite-based cybernetics system. Certainly some of the research being dedicated to "mapping of the brain" shows this potential. We are in receipt of preliminary information which points to magnetic resonant imaging as being critical to process. Our information is that far too many physicians are urging patients to undergo unnecessary MRIs -- patients whose short-lived, if painful symptoms surfaced in so-called "sick buildings." We intend to look into this situation, of course. The Electronic Surveillance Project is currently dedicated to helping victims of directed-energy harassment and experimentation to survive their respective ordeals until such time that Congress can be persuaded to intervene. We do believe that polite, precautionary comments concerning "a more precise understanding of...operational constraints" should be delegated to government agencies which have a primary role in development of these technologies. Whither the KGB? - In February 1974, Georgetown University's Center for Strategic and International Studies (CSIS) hosted discussions on the plight of dissenters in the Soviet Union, and on a means by which the U.S. Government might most effectively intervene. highlights of these discussions are reported in "Understanding the Solzhenitzyn Affair: Dissent and its Control in the USSR," (CSIS, 1974). KGB strategies were addressed in some detail during these discussions. It was noted that the KGB's success depended on the extensive use of informant networks and agent provocateurs; and, following Brezhnev's rise to power, on the use of drugs and psychiatrists for further purpose of manipulation and control. Shadowing, bugging, slandering, blacklisting and other related tactics were also cited as serving KGB purpose. Participants in the conference agreed that the KGB's obvious intent was to divide and isolate the populace, to spread fear, and to silent dissenters. Agencies of our own government are on record as having employed precisely these same tactics on a recurrent basis. The Church and Rockefeller Committee Hearings in the mid-70's purportedly put an end to these practices. Based on recent developments, it would appear that the CIA's and FBI's Operations MKULTRA, MHCHAOS and COINTELPRO (the focus of these Senate Committee and Vice-President- level Hearings) were instead merely driven underground. We are now in contact with a total of 25 individuals, scattered throughout the United states, who firmly believe they are being harassed by agencies of the U.S. Government. Others have been brought to our attention whom we will be contacting in the future. The majority of these individuals claim that their harassment and surveillance began in 1989. 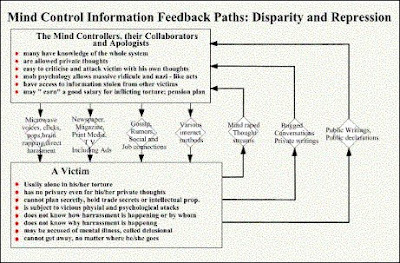 The methods reportedly employed in these harassment campaigns bear a striking resemblance to those attributed to the CIA and FBI during Operations MKULTRA, MHCHAOS and COINTELPRO. 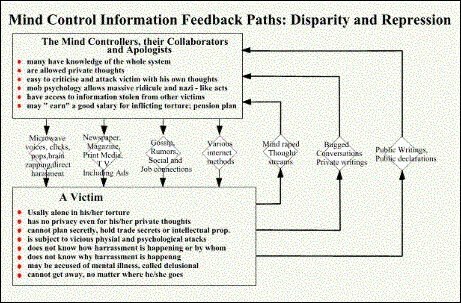 The only difference now is that electronic harassment and experimentation also appear to be (more blatantly) involved. The Berlin Wall is down, Communism is in the midst of a death rattle, and the KGB no longer poses the threat which purportedly served to justify the U.S. Government's resort to such operations as MKULTRA, MHCHAOS and COINTELPRO. The KGB, since 1989, has been reduced to an increasingly distant memory. Reactivation of surveillance/harassment/mind-control operations in this country suggest that the KGB, as an institution, was never the real threat. A KGB "mentality," which is underlying pragmatic contempt for civil liberties, appears, instead, to have been the driving force behind MKULTRA, MHCHAOS and COINTELPRO, and the operations now being reported to us. The KGB "mentality" is a matter of personal predilection, not ideology. Its objective is power and control, regardless of human cost. It is a corrupting, cancerous influence, which feeds on fear, conformity and government funding. Four months ago, when this Project commenced, we approached these complaints of government harassment and experimentation with an admitted "high degree of caution." We are no longer skeptical. The growing numbers of independent complaints and the similarities between those complaints cannot be ignored. Under the circumstances, the KGB should be proud of itself. As a "mentality," the KGB appears to be accomplishing more in "burying this country" from within, than it could ever have hoped to have achieved as an institution. It would appear that this country has a serious problem on its hands which needs to be resolved. In Part II, we do not identify individuals by name, both to honor their privacy and because our investigations have not been completed. Part II, like Part I, is a preliminary finding. Our focus is on the similarities of the complaints being received -- similarities which Federal and State legislators, the courts, the FBI, local law enforcement agencies, the medical and psychiatric professions, and organizations such as the ACLU and Amnesty International have so far chosen to ignore. We frankly find it curious that more attention and creditability is being accorded purported victims of UFO experiences and spectral visitations, than to persons who complain of systematic harassment and experimentation by the U.S. Government, involving technologies which the U.S. Government is only now grudgingly admitting to possess. These complaints require investigation. In due course (and provided financial support is obtained), we hope to be able to acquire the technology and supportive medical expertise to substantiate the claims being made. We also hope to alter the institutional mindset that U.S. Intelligence can be trusted. History, repeatedly, has proven otherwise. PART 1 - THE PROBLEM SURFACES - [Reprinted from the June-July 1992 edition of UNCLASSIFIED (Vol. IV, No. 3), published by The Association of National Security Alumni, Washington, D.C.] The August-September 1991 issue of UNCLASSIFIED reviewed Hamline University's "Public Administration" report on the resolution of MKULTRA cases in 1988. Although the shocking details of medical ethics abuses by the U.S. and Canadian governments were amply detailed, Washington and Ottawa -- citing national security and government privilege -- stalled for so long that cases never came to trial. the surviving victims settled for a pittance in an out-of-court settlement. Since no individuals or agencies were held legally accountable, the door was left open for possible resumption of similar "mind-control" activities. In the context of that article, we mentioned briefly that some half-dozen people had contacted us with appeals for assistance in ending what they believe to be electronic harassment and mind-control experimentation, possibly involving the CIA. We decided totake a closer look at the situation. We are now in touch with approximately a dozen individuals throughout the United States who appear to be targets of harassment and mindcontrol experimentation involving directed-energy technologies. [By mid-November 1992, the number had increased to 25.] Typically, persons who complain of being "zapped by radio waves" and of "hearing voices" are stigmatized as psychotic, delusional or schizophrenic. Being mindful of this, as well as aware of the treatment accorded UFO and psychic phenomena "freaks," we approach this subject with a high degree of caution. Based on our preliminary investigation, including interviews with the affected individuals, we conclude that the matter is serious and should be pursued further. The Existing Directed-Energy Arsenal - Our first step was to determine what, if any technology exists which might be used for electronic harassment. The information was found in a "white paper" published in 1991 by the U.S. Global Strategy Council -- a Washington-based organization, under the chairmanship of Ray Cline, former Deputy Director of the CIA, who maintains very close ties with the U.S. Intelligence community. 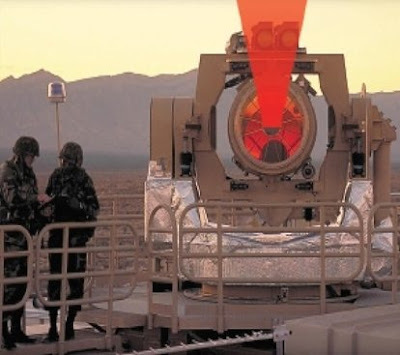 The "white paper" describes the foreign and domestic uses foreseen for laser weapons, isotropic radiators, infrasound, non-nuclear electromagnetic pulse generators, and high-powered microwave emitters. The term, "non-lethal," used to describe this technology is misleading. the energy emitted from all of these weapons can kill people when appropriately amplified. At lower levels of amplified, they can cause extreme forms of physical discomfort and debilitation. The Department of the Army (DA) identifies these same weapons as "non-conventional." They were so identified in an exhibit at a DA-sponsored symposium on "The Soldier As A System," in Crystal City, VA, on June 30, 1992. Beta wave incapacitators were separately mentioned during the symposium as being particular interested to the U.S. Marine Corps. We discussed these "non-conventional" directed-energy weapons with Mr. Vernon Shisler, manager of the exhibit and the Army's delegate to NATO in matters pertaining to "The Soldier As A System." Mr. Shisler acknowledged not only that directed-energy weapons are in the Dod's arsenal, but also that the American soldier will remain vulnerable to their effects, should they be employed in the battlefield. The U.S. Global Strategy Council recognizes the issue of vulnerability, as well, and urges ongoing research into effective countermeasures. Interested readers may want to send for the U.S. Global Strategy Council's complete project proposal on this subject: (Title:Nonlethality: Development of a National Policy and Employing Nonlethal Means in a New Strategic Era, prepared by Janet Morris). A number of references in this Proposal to unidentified, elusive "enemies" of the U.S. Government and the potential domestic applications of this "non-lethal" technology invite serious consideration by the public at large. The Council's address is 1800 K Street, N.W., Washington, D.C. 20006, (202) 466-6029. BIOEFFECTS OF MICROWAVE RADIATION - Research into biological and psychological effects of exposure to microwave radiation is voluminous. The U.S. public has been led to believe that the former Soviet Union leads in this research. The fact is, the CIA and DoD [Department of Defense] have jointly pursued precisely the same research since commencement of Project Pandora in the 1950's. The current primary users of this research appear to be the CIA, DoD, the National Security Agency (NSA) and the Department of Energy (DoE). The Walter Reed Army Institute of Research (WRAIR) has participated in this research since Project Pandora. In 1973, WRAIR discovered that externally-induced auditory input could be achieved by means of pulsed microwave audiograms, or analogs of spoken words' sounds. The effect on the receiving end is the (schizophrenic) sensation of "hearing voices" which are no part of the recipients' own thought processes. The experiment prompted the following comment in "The Body Electric: Electromagnetism and the Foundation of Life," by Robert O. Becker, M.D., and Gary Selden (Wm. Morrow & Company, NY, 1985): "Such a device has obvious applications in covert operations designed to drive a target crazy with 'voices' or deliver undetected instructions to a programmed assassin." This research has continued, and the results are published in various publicly available scientific and technical journals. Interested readers might consult, for example: Lin, James C., Electromagnetic Interaction With Biological Systems (Plenum Press, NY, 1989). Professor Lin, then with the Department of Bioengineering, University of Illinois, Chicago, has published a number of books and articles on this subject. [He has more recently informed us that he had designed the experiment referred above in Dr. Becker's book.] WRAIR has more recently been studying the biological effects of exposure to high power microwave radiation. WRAIR presented a paper on this subject to a DoD-sponsored symposium on "MW [microwave] Weapons" at the Naval Postgraduate School in Monterey, CA, in mid-1989. A matter of interest to us is why WRAIR should be experimenting with auditory effects of pulsed microwave audiograms. Also, recent statements by an Army psychiatrist assigned to the Walter Reed Army Medical Center (WRAMC) suggest that WRAIR may be experimenting upon select psychiatric inpatients with microwaves. This, too, is a matter to us. CONGRESSIONAL OVERSIGHT - The Government's past record of abuses in the area of civil rights is well documented. Within the past 30 years alone, we have witnessed the effects of Operations MKULTRA, MHCHAOS and COINTELPRO. Primarily because of MKULTRA, MHCHAOS and COINTELPRO, Executive Orders and implementing regulations were published which prohibited military and CIA domestic covert intelligence operations. Experiments on involuntary human subjects, and the surveillance of/collection of personal information on U.S. citizens, except under strictly regulated conditions were also prohibited. Congressional committees were created to oversee compliance with these (quasi-) legal prohibitions. We have evidence that this is not being done. Moreover, where there are laws and, in this case, no laws enacted, there are loopholes, as well as individual and institutions who deliberately capitalize upon the existence of loopholes. Iran-Contra is one of the more blatant recent examples. Loopholes are also found in government resort to "black" intelligence and weapons programs, in the use of contractors, and in the absence of clear definitions of such terms as "national security" and "national security risk." Executive Orders and regulations which currently limit U.S. Intelligence activities do not extend to non-intelligence government agencies or to their contractors. If fact, Executive Order 12333 specifies that government contractors do not need to know that their services support U.S. Intelligence objectives. In its report of July 8, 1992, the Senate Subcommittee on Oversight of Government Management addresses the problem of tracking funds granted to government-contracted research and development (R&D) centers. The report notes that the problem is compounded by DoD's penchant for creating hard-to-monitor "shell" contractors as disbursement centers for funding programs. Neither shell contractors nor their subcontractors are directly accountable to Congress. Being beyond Congressional oversight, they have the license to operate as Government surrogates in intelligence operations about which, "officially" they know nothing. In this context, a publication disseminated at DA's "The Soldier As A System" symposium noted that the Army's Research and Technology Program sponsors 42 laboratories and R&D centers, employing approximately 10,000 scientists and engineers. The annual budget of $1.3 billion is only a small part of overall DoD research spending. Weapons research, which includes the development and testing of "non-lethal" weapons, is not governed by laws restricting the activities of U.S. Intelligence agencies, though it may be presumed that these agencies contribute to and benefit from such research. 6. A number of U.S. Government agencies might have interest in testing directed-energy technologies on U.S. citizens under non-clinical/noncontrolled circumstances -- DoD, to test ranges and degrees of "non-lethality"; DoE, to explore "safety" limits; CIA, to test "mind-control" capabilities, and NSA, for technological refinement.